The Giant & Dwarf has been updated for today’s children’s entertainer and a whole new generation kids. With contemporary graphics that will relate to your audiences, the bright colors and inviting detailed figures have been drawn by a Hollywood concept artist employed by AmazeKids’ partner Wack-O-Magic. See the results yourself in the accompanying picture. 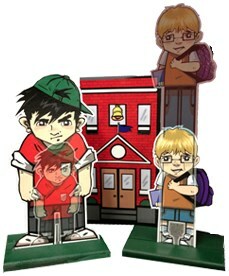 Taller and Smaller is now up to date, and if you do shows with an anti-bullying theme, it’s a terrific storytelling prop to deliver a message about the importance of inclusion. You get all the necessary props including a modern-day approach to the gimmick that incorporates small powerful magnets to prevent fumbling when you do the secret move that makes the small boy’s legs grow. Included also, is a patter by California magician Walt Anthony that has been approved by Stan Davis, the country’s most in-demand, bullying-prevention author and speaker. If you’re unfamiliar with the standard plot and handling, watch AmazeKids’ Danny Orleans take you through it step-by-step on the above video. Created by Jack Hughes in the 1950s, the large boy picks on the small boy, so he runs into the school and up to the roof where he’ll be safe. His friends on the playground (played by your young audience) can see him and give him verbal support. His self-confidence grows and magically, he does too! The larger boy then enters the school but, because he’s a bully, he does not get the children’s support and he shrinks to normal size. The lesson is delivered: Supporting and including others in every-day activities is the best way to have friends. The sturdy “packs small/plays big” prop is designed for the working performer, but like many of Wack-O-Magic’s creations it is of exceptional quality, and handmade in small numbers so if you purchase one, you’re likely to be the only one in your city to perform it. Get Taller and Smaller. Perform it with or without an anti-bullying theme -- the choice is yours. Either way, you’ll be presenting a great story-telling trick with a magical, double transformation that your audience will talk about for a long, long time.